Adela Fargas, owner of the Avenue C institution Casa Adela, died yesterday morning, according to friends of the Puerto Rican restaurant. There wasn't much information immediately available about her death. ¡Q.E.P.D. ADELA! R.I.P. ADELA! ¡HOY PR, NY y la Diáspora entera se viste de luto ante la partida de una verdadera GUERRERA BORICUA! Q.E.P.D / R.I.P Adela 💔🇵🇷 Heavy hearted this morning to learn that Adela Fargas of Casa Adela passed away this morning. All Puerto Rican’s feel your loss... from the island and throughout the Diaspora. You will always be one of our best Boricua success stories. My prayers are with her family and loved ones. My favorite memory I have of Adela’s love for her community is when she saw the poster I did for the LOISAIDA Festival in 2016. She always put her favorite posters under the glass of her tables. With pure pride that she radiated, as she put my poster under the glass Was contagious. It made me feel like I was putting my art in the MoMa! That’s how she made people feel... everyone was special. And she definitely was a blessing to everyone who had the opportunity to know her. Adela, te queremos, vamos a extrañar tu chispa y sabor. Before opening Casa Adela at 66 Avenue C in 1976, she ran a luncheonette one block to the south. It was there, as a feature in The New York Times from 2015 points out, that she perfected the seasoning for her famed rotisserie chicken. Her son is so nice. He shared that his mother always fed the hungry who knocked on the window. He and his wife and sister would like to keep the restaurant going. My condolences to the family. Casa Adela is a treasure. RIP Adela. 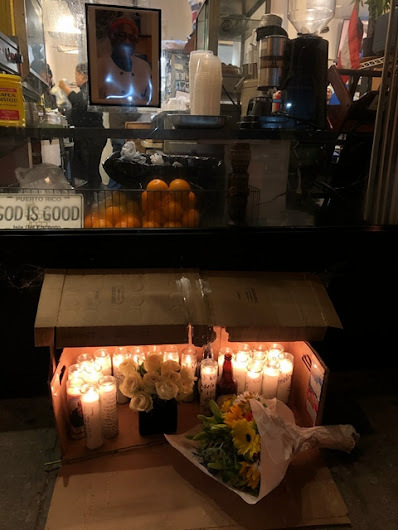 Thank you for all the good food and kindness you shared here in the East Village over the years. I didn't really know Adele but met her once at the restaurant. She exuded so much positive loving energy. It's good to hear that her family will continue providing the community with love and delicious food. I loved Mrs. Adela and her food and the warm, homey Casa Adela. Deepest condolences to her family and many friends, and much praise and gratitude to her sweet, loving spirit. First time I ever had Mofongo was at Adela's. It's a rare place in an ever changing neighborhood. I'm so glad that it will be here to stay. Rest In Peace! My deepest sympathies to all her family and friends. I've long loved eating at Casa Adela. Was just there a couple of weeks ago for the sancocho after recovering from the latest illness circulating. Better than penicillin. Mi sentimientos! Condolences to the entire family. 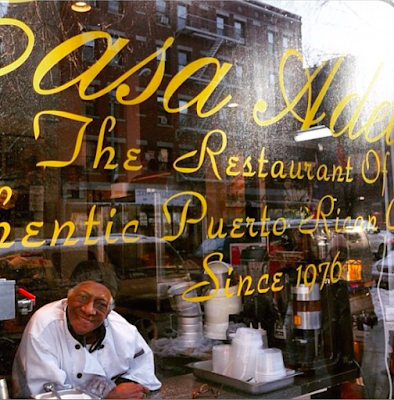 The first time I ate at Casa Adela was during my initial trip to NYC in 2002. I’ve been back to the City about a dozen times since, and each visit was highlighted by lunch at Adela’s. Even though I live 3000 miles away in LA, Adela’s always felt like it was right around the corner from home. The food was tasty and soulful, filled with flavor and steeped in love for the island. I am so grateful to have actually met Adela on one occasion, and the photo that I took with her will always bring a smile to my face. My thoughts and prayers to the entire family. The queen of Loisaida. Best pollo in the city. I’ll miss her and her hugs so much. 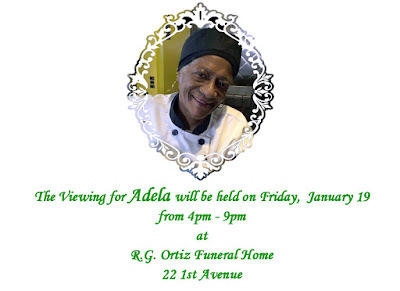 Thank you, Adela, for all of the good food and for being an inspiring figure as a businessperson and a human being.